Audrey Jun is the Clicklaw Program Coordinator at Courthouse Libraries BC. She manages Clicklaw, working to connect people across the varied public legal education landscape. Audrey was called to the BC Bar in 2014 and combines backgrounds in law, public legal education, and technology. We previously discusse d “Unbundling” in this introductory post. In short, unbundled legal services means clients pay for some assistance depending on: (1) what they want help with and (2) what they can afford. It is ideal for clients who value cost predictability and prefer to play a more active role in their own legal matter. 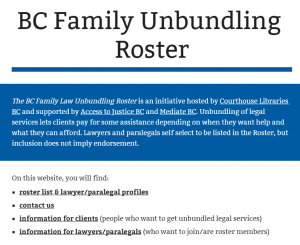 The BC Family Justice Unbundled Legal Services Project has now released their Final Report, which gives some more background on the project designed to encourage more BC family lawyers to offer unbundled legal services to BC families who wish to resolve issues arising from separation and divorce through out-of-court processes including mediation. The Report details the project’s activities, and contemplates the future of the project. You may also access the Unbundling Roster on the Clicklaw HelpMap here.